The humanitarian crisis unfolds before her eyes in the television reports. Emilsa Bautista, owner of a Guatemalan bakery located in Northwest Dallas, hasn’t been able to stop watching the news about the migrant caravan coming from Central America. She is reliving the trauma she experienced 25 years ago when she left her native Guatemala. “I can feel these mothers and children who are trying to get here because in our countries there are very few opportunities for us to survive,” Bautista said. She was abused countless times in unspeakable ways as a child. She was forced to work to feed her younger siblings, while going hungry. She never went to school. She didn’t have a role model to look to for guidance, and her interactions with adults were always painful. Her country was falling apart due to a civil war fought from the ‘60s to the ‘90s between the government and various leftist rebel groups. So, she ran away in 1993. “Those of us who come here are not criminals. We are not here to commit violence. We work, we pay taxes, and we help to raise the economy of this country,” she said. The wave of immigrants to the United States is not going to stop, immigration experts predict. There are many reasons for Central Americans to leave countries torn by violence and hunger: the promise of the American Dream. Decent schools to attend. An abundance of low-paying jobs (often filled by immigrants). Greater levels of safety. Reunification with family. “People are really looking to improve their lives, they are not thinking about the risk of traveling or if they have to do it by foot or by paying a coyote. 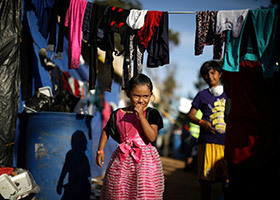 The main driver there is to escape from the day-to-day struggle,” said Gustavo Villanueva, member alongside his wife, Cecilia, of Educate the Children Honduras, a mission initiated by the Diocese of Fort Worth after deadly Hurricane Mitch in 1998. The couple has been traveling to remote rural areas of Olancho (Valle Alegre and Barro Seales) for almost 10 years, to work in the Catholic schools built by the diocese in 2005. As public education ends at the sixth grade level, ETC Honduras is filling a need by providing seventh-11th grade education in these poor mountainous regions. The Villanuevas, both about to turn 60, have seen firsthand the struggle of the locals in rural places where there is still no electricity or running water, and dengue fever is still a serious threat. They have seen the single father who can barely put food on the table for his three kids, let alone buy them uniforms for school. They have talked to kids who have to take care of younger children in the community, instead of going to classes. They know of a parent who — out of desperation — sent his 16-year-old daughter to cross the U.S. border nine months ago. He hasn’t heard from her yet. More than 60 percent of the population lives in poverty and there is a persistent lack of economic opportunities according to the Association for a More Just Society (AJS). They learned about the five priests who celebrate Masses and minister in 90 villages located up in the country’s rugged highlands. When one of them shows up, locals take the opportunity to have their children baptized, receive their First Communion, or any other sacrament integral to their lives as Catholics. But just as religious services are scarce, medical personnel can only be seen during international healthcare missions in which up to 900 people line up in search of answers to their body pains. The combination of organized crime and street gangs that control large swaths of territories, plus corrupt governments, shadows the future of many across Central America’s Northern Triangle, a region that includes El Salvador, Guatemala, and Honduras. According to the United Nations Refugee Agency (UNHCR), in 2017 more than 294,000 people were forcibly displaced by violence in this region. That cycle of violence is perpetuated, the AJS states, as 96 percent of homicide cases are left in impunity and another 80 percent are never investigated. North Texas has witnessed the pursuit of that golden opportunity. The exodus of Salvadoran families that fled the explosion of the civil war in the early ‘80s put down roots in North Texas and Houston. According to the Consulate of El Salvador in Dallas, there are close to 135,000 Salvadorans in the DFW area, most of whom are living under Temporary Protected Status (TPS). TPS was formed in 1990 to allow foreign citizens fleeing humanitarian disasters to find safe haven in the U.S.
Last year, the Department of Homeland Security announced it would end TPS for recipients from four countries, including El Salvador. The program has allowed many Salvadorans to live and work legally in the U.S. A district court judge this fall blocked its cancellation citing possible constitutional violations. “Our brothers are not going to take one step back,” said Antonio Herrera, who founded the Monseñor Romero Community Center, a non-profit organization dedicated to providing immigration workshops and technical classes in Irving. Herrera is helping Bautista, the baker from Guatemala, arrange a little space in her panadería to store the supplies she and other Central American immigrants have been collecting to help incoming asylees and immigrants. 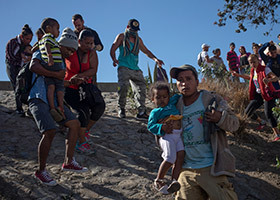 Tennis shoes, socks, diapers, children’s clothes, feminine products, blankets, coats, and over-the-counter medication are part of the supplies these immigrants are planning to send to Tijuana, Mexico at the border with California, where thousands of Central Americans coming in the caravan were received with protests at the beginning of November. 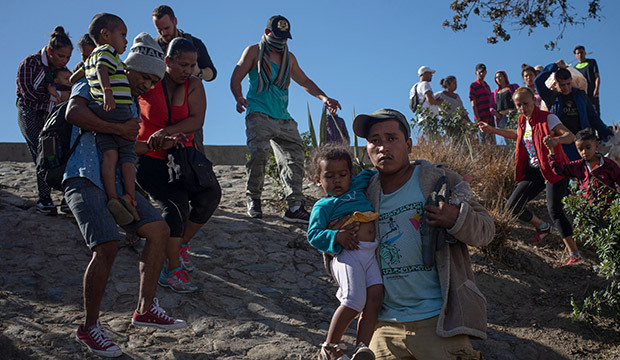 After walking thousands of miles under hazardous conditions to reach the border, immigrants’ main goal is to ask for asylum, a right protected under international law. 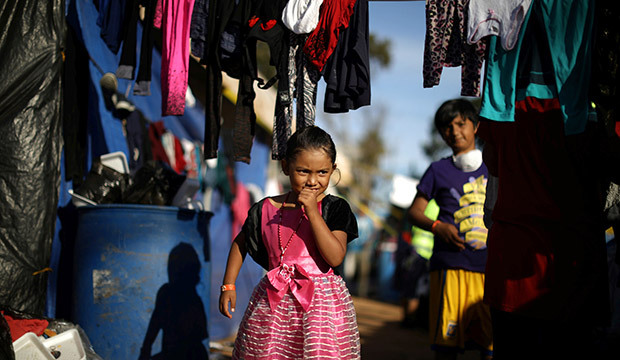 But the Trump Administration aimed to restrict asylum laws while slashing the annual cap on refugees from 110,000 in 2016 to 45,000 in 2018. A federal judge put a temporary hold on the policy change Nov. 19. “We have seen the troops at the border and the mothers crying,” Bautista said. “But until governments here and there don’t sit together to discuss common solutions, those images are going to be with us, year after year,” she concluded. “The Catholic Church will continue to serve, accompany and assist all those who flee persecution, regardless of where they seek such protection and where they are from,” the Catholic leaders added.